Welcome to the MyCarDoesWhat Media Room. 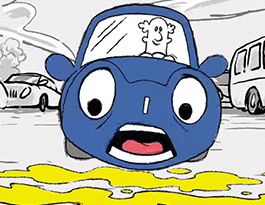 Here you can find resources on car safety features and media contacts for the campaign. You may also download our background PDF, which contains information about the campaign’s origins and key facts about car safety features. You can find videos, graphics and press releases about the campaign in the Media Room. Please let us know if you are looking for additional assets or information about the campaign by emailing us at press@mycardoeswhat.org. For information on contributing to the MyCarDoesWhat blog, please see our blog guidelines. Campaign Downloads If you are interested in downloading high-resolution video or graphics, please fill out the request form. Once approved, you will receive a link to download. Please see the Terms & Privacy for more information on approved uses of campaign assets and providing credit. 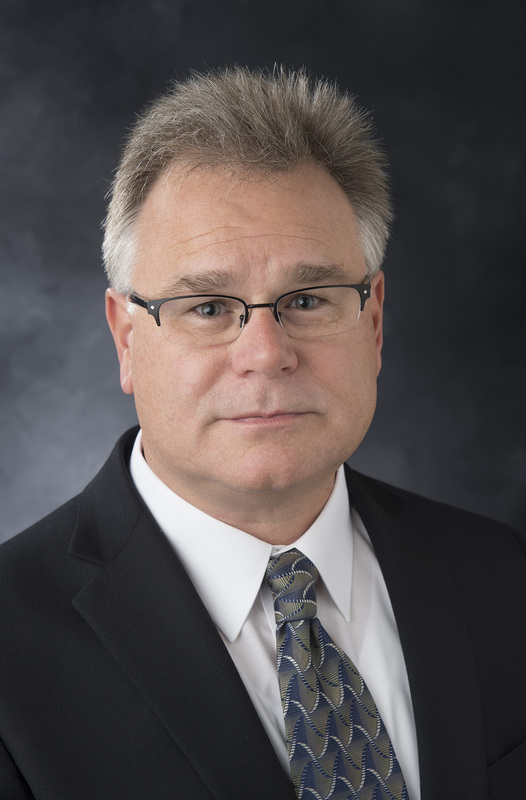 Daniel McGehee, Director of the Transportation and Vehicle Safety Research Program at the University of Iowa, discusses MyCarDoesWhat – a national driving safety campaign. 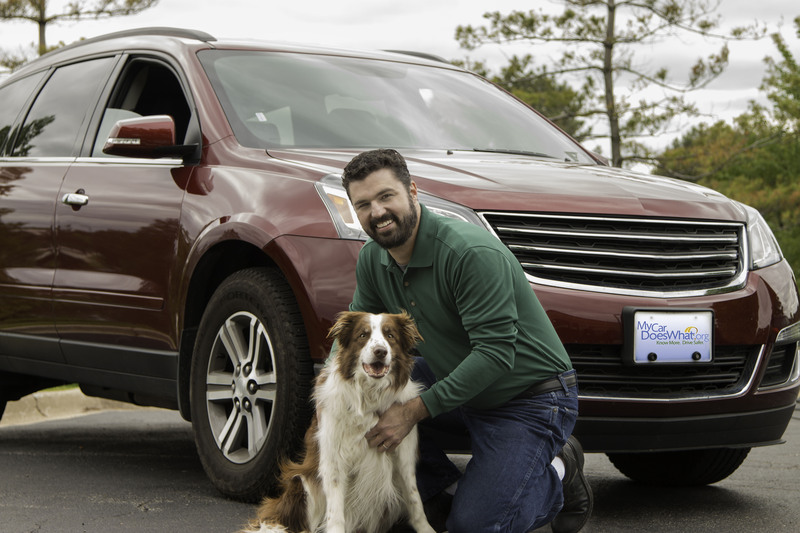 MyCarDoesWhat helps educate drivers on new vehicle safety technologies designed to help prevent crashes. This footage was filmed October 7, 2015, in Washington, D.C. at the MyCarDoesWhat campaign’s official launch. This “sizzle reel” was shown at the MyCarDoesWhat campaign’s official launch on October 7, 2015 in Washington, D.C. 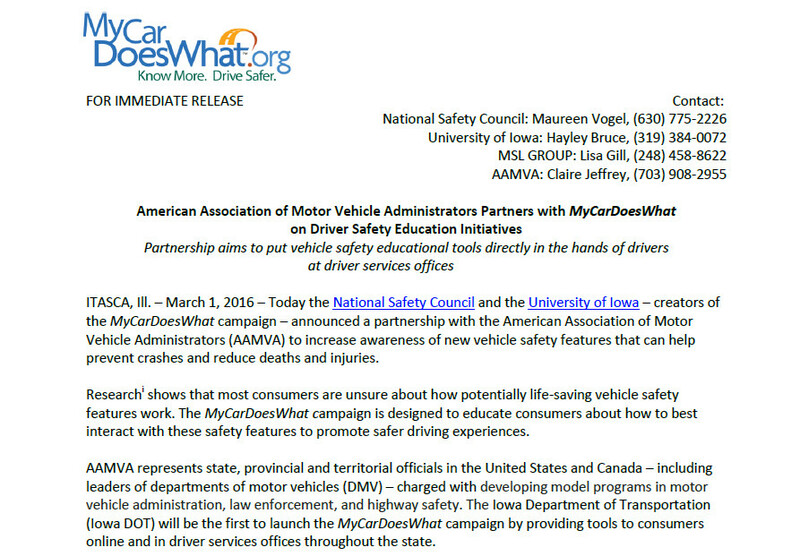 The MyCarDoesWhat campaign is operated by the National Safety Council and the University of Iowa. This is the animated logo of the MyCarDoesWhat campaign. It can be downloaded as a video file. This campaign operated by the National Safety Council and the University of Iowa. This is the 30 second version of the MyCarDoesWhat public service announcement. This is the full version of the MyCarDoesWhat public service announcement. 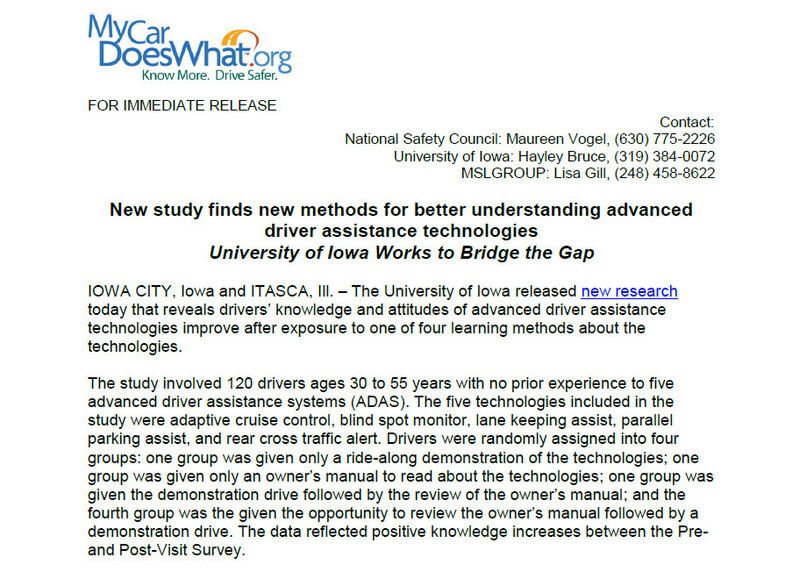 IOWA CITY, Iowa and ITASCA, Ill. – The University of Iowa released new research today that reveals drivers’ knowledge and attitudes of advanced driver assistance technologies improve after exposure to one of four learning methods about the technologies. 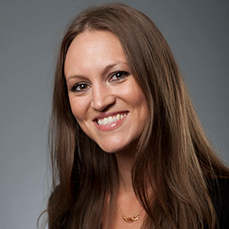 The study involved 120 drivers ages 30 to 55 years with no prior experience to five advanced driver assistance systems (ADAS). The five technologies included in the study were adaptive cruise control, blind spot monitor, lane keeping assist, parallel parking assist, and rear cross traffic alert. 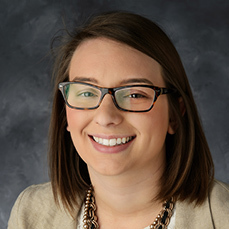 ITASCA, Ill. and IOWA CITY, Iowa – November 14, 2016 – New social media analysis from MyCarDoesWhat – an initiative of the National Safety Council and the University of Iowa – found the U.S. public’s attitudes toward vehicle safety features have become increasingly more positive within the past year-and-a-half. 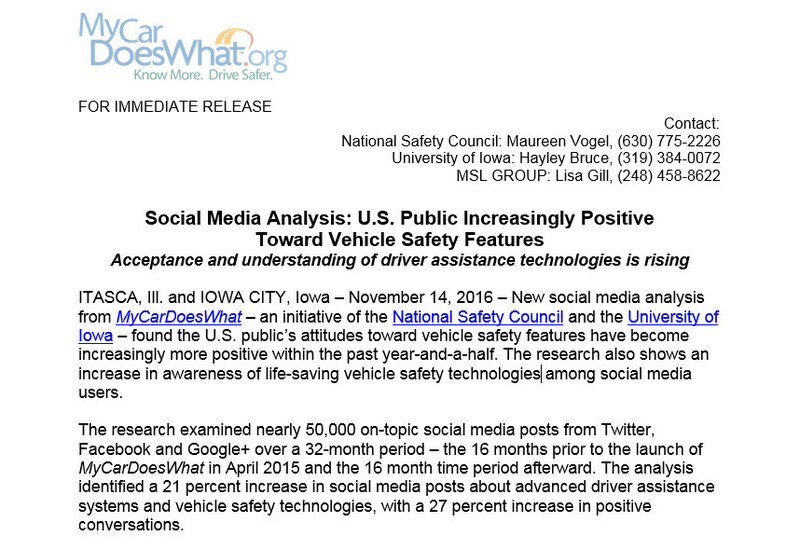 The research also shows an increase in awareness of life-saving vehicle safety technologies among social media users. 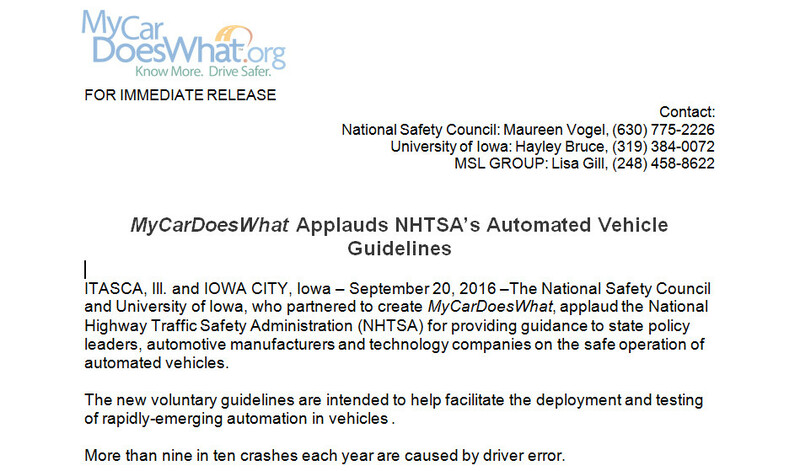 ITASCA, Ill. and IOWA CITY, Iowa – September 20, 2016 –The National Safety Council and University of Iowa, who partnered to create MyCarDoesWhat, applaud the National Highway Traffic Safety Administration (NHTSA) for providing guidance to state policy leaders, automotive manufacturers and technology companies on the safe operation of automated vehicles. 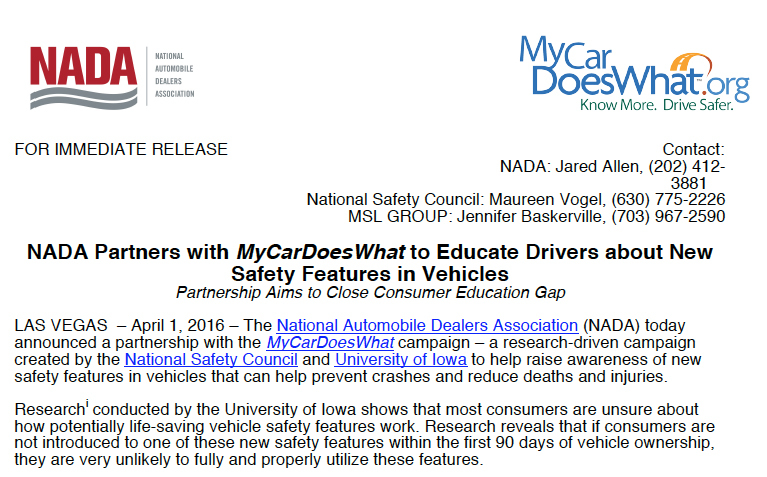 LAS VEGAS – The National Automobile Dealers Association (NADA) today announced a partnership with the MyCarDoesWhat campaign – a research-driven campaign created by the National Safety Council and University of Iowa to help raise awareness of new safety features in vehicles that can help prevent crashes and reduce deaths and injuries. 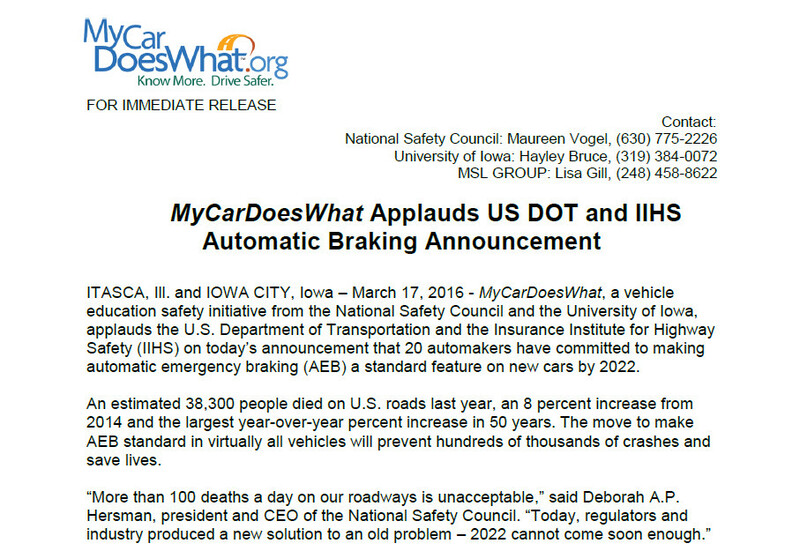 ITASCA, Ill. and IOWA CITY, Iowa – MyCarDoesWhat applauds the U.S. Department of Transportation and the Insurance Institute for Highway Safety (IIHS) on today’s announcement that 20 automakers have committed to making automatic emergency braking (AEB) a standard feature on new cars by 2022. 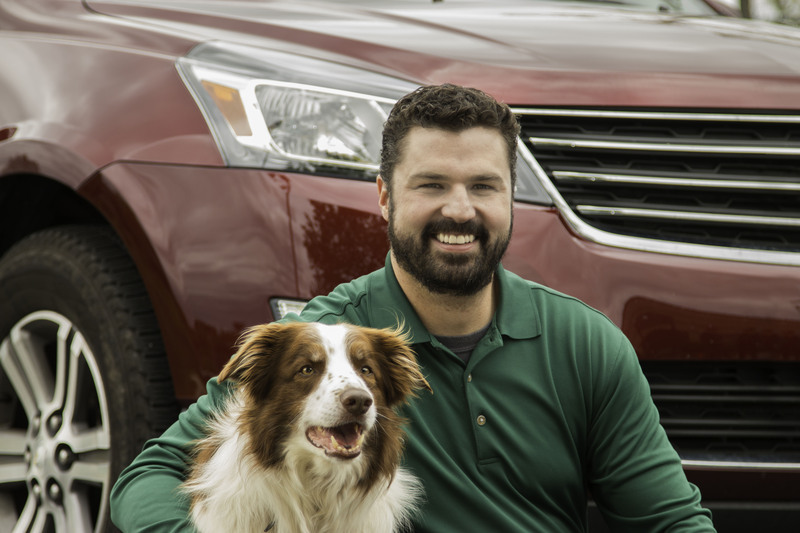 ITASCA, Ill. – Today the creators of the MyCarDoesWhat campaign announced a partnership with the American Association of Motor Vehicle Administrators (AAMVA) to increase awareness of new vehicle safety features that can help prevent crashes and reduce deaths and injuries. 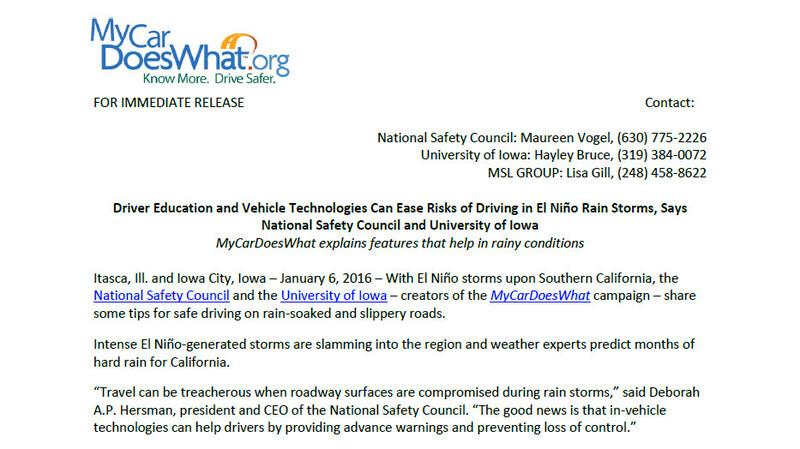 Itasca, Ill. and Iowa City, Iowa – With El Niño storms upon Southern California, the National Safety Council and the University of Iowa – creators of the MyCarDoesWhat campaign – share some tips for safe driving on rain-soaked and slippery roads. 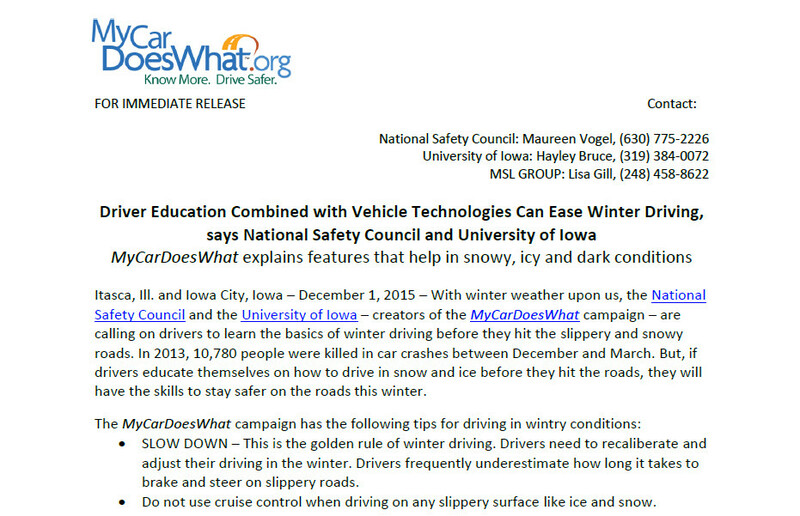 Itasca, Ill. and Iowa City, Iowa – With winter weather upon us, the National Safety Council and the University of Iowa – creators of the MyCarDoesWhat campaign – are calling on drivers to learn the basics of winter driving before they hit the slippery and snowy roads. Iowa City, Iowa – A new, one-of-its kind study from the University of Iowa found that a majority of drivers expressed uncertainty about how many potentially life-saving vehicle safety technologies work. 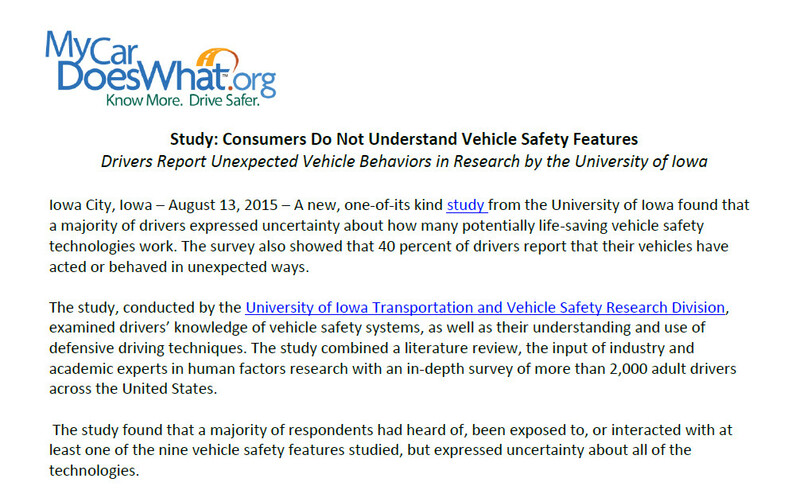 The survey also showed that 40 percent of drivers report that their vehicles have acted or behaved in unexpected ways. 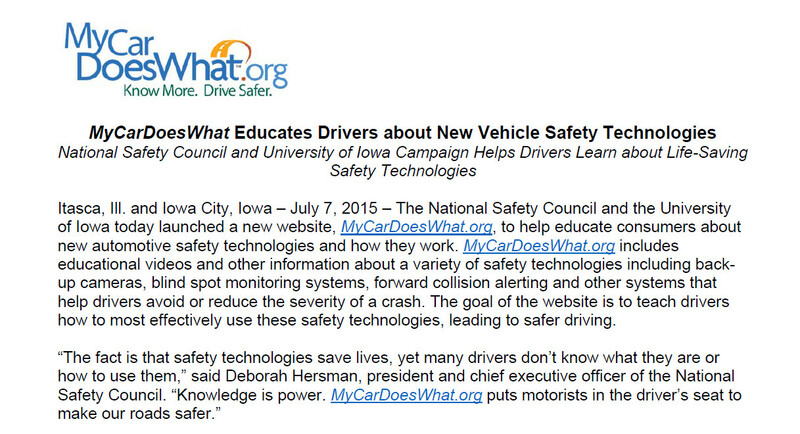 Itasca, Ill. and Iowa City, Iowa – The National Safety Council and the University of Iowa today launched a new website, MyCarDoesWhat.org, to help educate consumers about new automotive safety technologies and how they work. 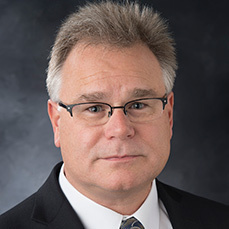 Daniel McGehee, Director of the Transportation and Vehicle Safety Research Program at the University of Iowa, which is a partner behind MyCarDoesWhat. 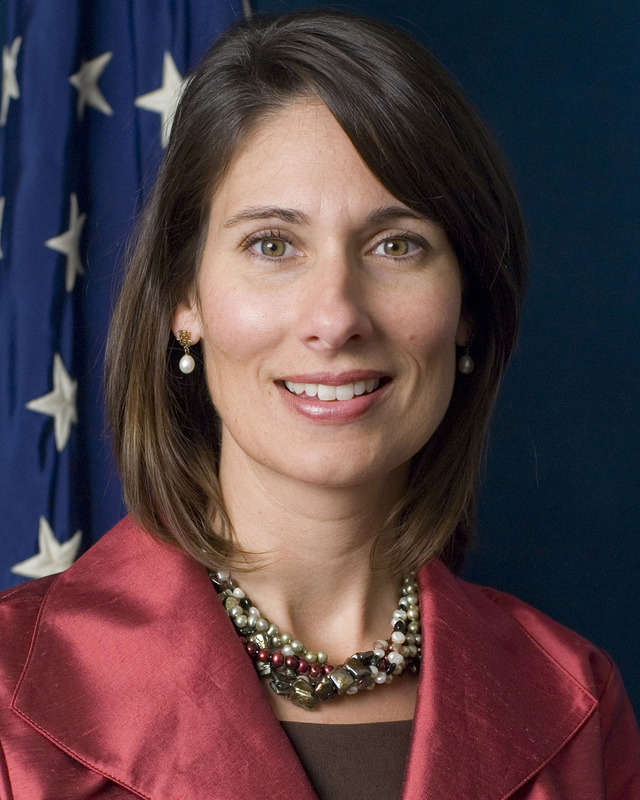 Debbie Hersman, President and CEO of the National Safety Council, which is a partner behind MyCarDoesWhat. This isn’t your high school science teacher’s periodic table. 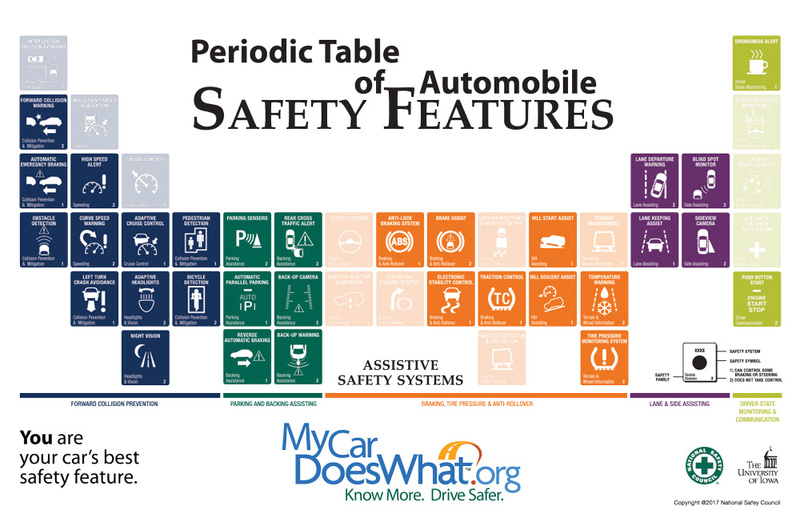 See the elements in a way you’ve never seen them before with our Periodic Table of Automobile Safety Features! True to its namesake, we will be updating it periodically. Share and come back often! A PNG version of the MyCarDoesWhat logo. A high-resolution JPEG version of the MyCarDoesWhat logo. A high-resolution vector version of the MyCarDoesWhat logo. Rick is the host of a series of informational videos that also feature his companion Scout. These videos are hosted in Videos & Graphics. 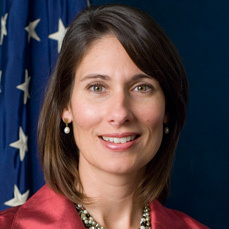 This is the same image that is found on the MyCarDoesWhat.org homepage. 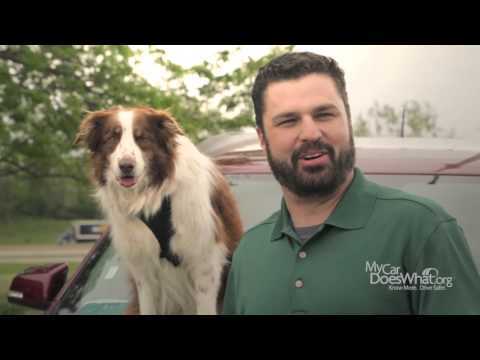 Rick is the host of a series of informational videos that also feature his companion Scout. These videos are hosted in Videos & Graphics. This is an alternate version of the image of Rick and Scout on the MyCarDoesWhat.org homepage. Please click “Request Download” to fill out a content request form. Once approved, we will provide you a link to your download.